This coming Friday, multiple a cappella groups from the University of Pittsburgh will use their voices not for saying "trick-or-treat," but to instead raise funds for Pittsburgh Public schools. 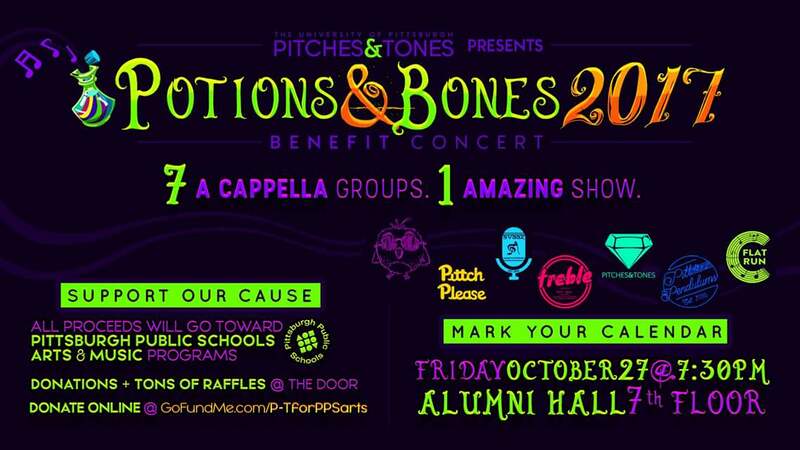 The event, "Potions & Bones" is the seventh annual Halloween Concert hosted by Pitches & Tones, one of seven aca-groups at Pitt and is scheduled for October 27th. Last year's event saw a new tradition being born as the coed group decided to turn their regular holiday concert into a benefit show in which all of the proceeds were donated to the arts and music departments of the Pittsburgh Public School district. Noticing the success of last year's efforts, the group decided to do the same for their 2017 event, but with one colossal change...invite every a cappella group on-campus to get involved. This year's charity event will feature performances by all seven a cappella groups from the university in hopes of putting an even bigger spotlight on the importance of keeping arts in the local community. "Music has played such an important part of everyone's life in Pitches & Tones, and with school budget cuts, it disheartens us that some children will not have the same opportunities that we had. As an elementary education major, this especially hits home for me." This will be an incredible night of both music and giving featuring performances by Pitt's very own Pitt Avaaz, C Flat Run, The Pitt Pendulums, Pittch Please, The Songburghs, Sounds Like Treble and Pitches & Tones. Donations will be accepted at the door. For those who wish to support this event but cannot attend, Pitches & Tones have set up a GoFundMe page with a target goal of $1,500. From now till November 1st, you can make a donation to support this great cause. To donate, click here. The show will be hosted on the University of Pittsburgh campus this Friday night starting at 7:30 PM in the Alumni Hall, 7th Floor Auditorium. For more details, visit the Facebook event page here.